(Optional) Specify an ID or name for the client making the request. (Optional) Field X name, where X is the field ID. (Optional) Metadata for the channel, which can include JSON, XML, or any other data. (Optional) Name of the channel. (Optional) Whether the channel is public. The default is false. You can use POSTMAN to try out your HTTP requests using the RESTful API for ThingSpeak. This example shows how to create a new channel using POSTMAN. Create a channel titled "My Channel" with three named fields: "Stuff", "Things", and "Data". Make the channel shared with everyone by setting the public_flag to true. Here is the format of the request. 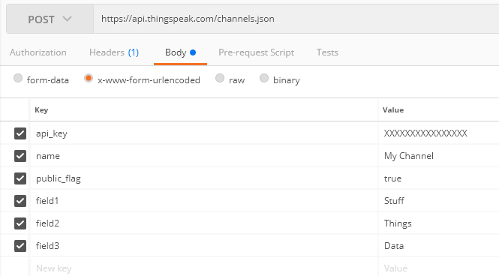 In POSTMAN, select POST from the drop-down list of HTTP verbs, and enter https://api.thingspeak.com/channels.json in the address bar. The response is in JSON format. Note the server response value of 200 OK, indicating successful creation of the channel. The new channel is now available on your channels page.